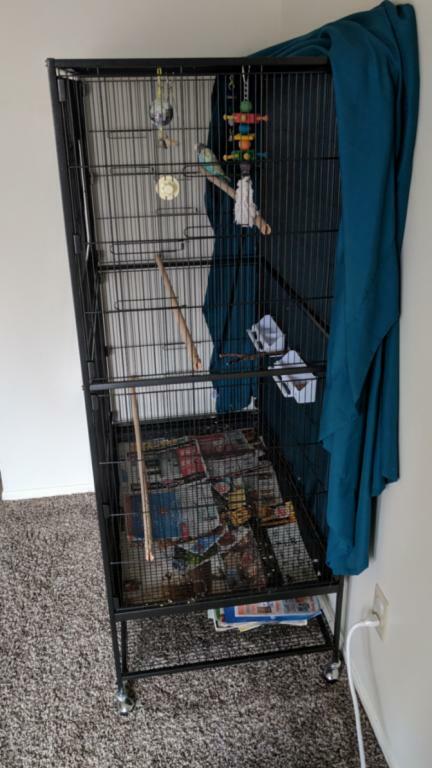 My husband and I were looking at new cages, because although Ozzy's cage was going to be big enough for both him and his new brother, we knew we eventually wanted a bigger one anyway. We ended up being stuck between the Prevue Hendryx F040 and F050 cages. They are basically the same cage, but the F050 is just a larger version of the F040. The F040 comes in both white and hammertone black and is a great size. The F050 is even bigger and it only comes in hammertone black at the moment. 31" x 20.5" x 53"
37" x 23" x 60"
We spent a couple weeks trying to decide! But we finally decided that we could always regret getting the smaller one and won't regret getting a larger one. Especially because we plan on getting more budgies in the future. 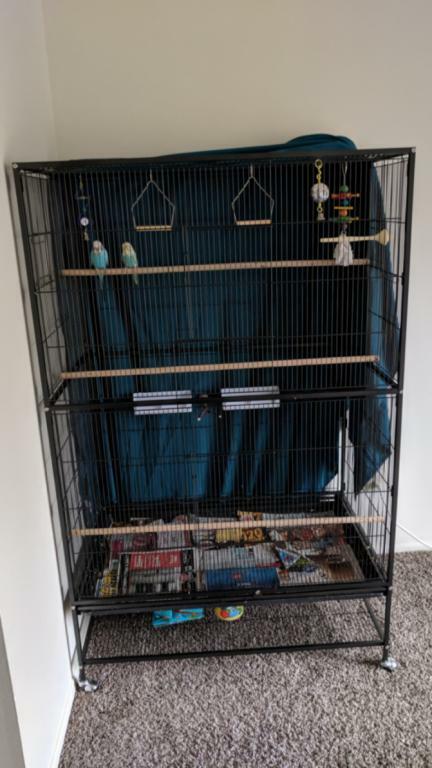 So we got the F050, and we actually got it with a coupon through Petco so the price was only like $20 more than the smaller cage. The cage arrived pretty quickly, and the two of us put it together. It was fairly easy to assemble, and took around an hour. We are very happy with it! 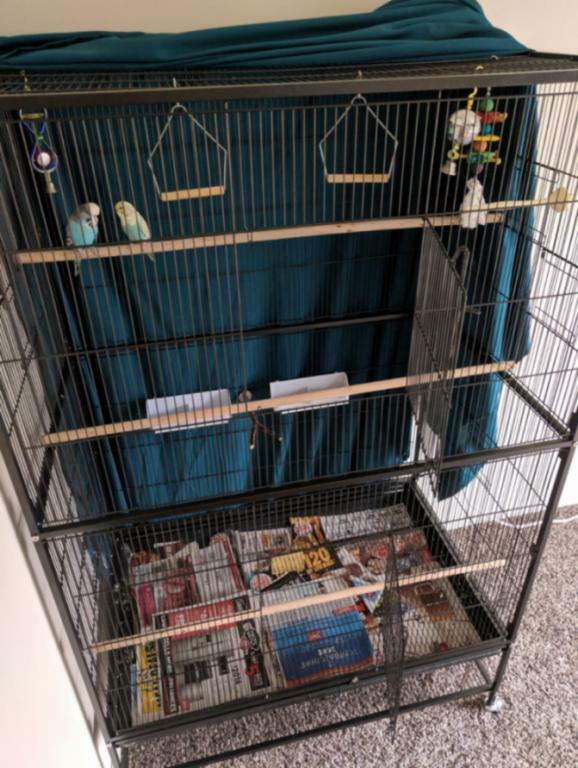 We have a pretty small living room and even though it takes up more space than the old cage, it has storage underneath so it clears up space elsewhere, storing all the budgie supplies, food, etc. 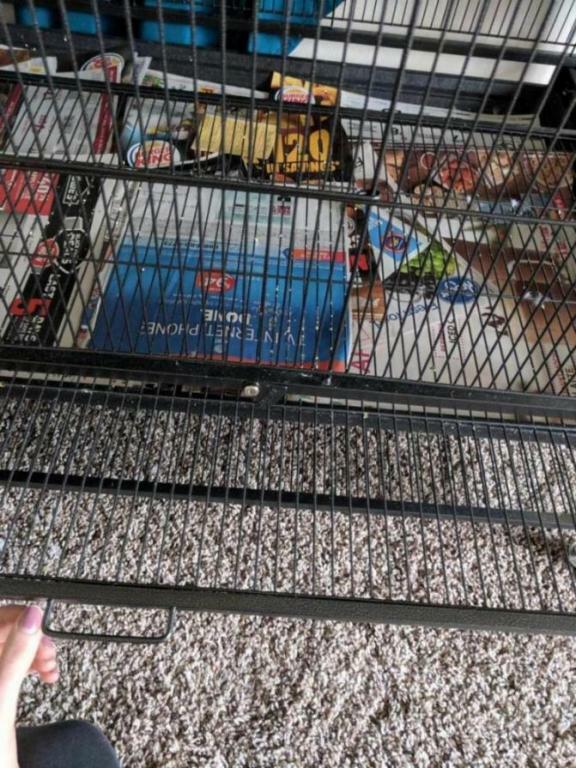 The shelf underneath the cage for storage is a great size. 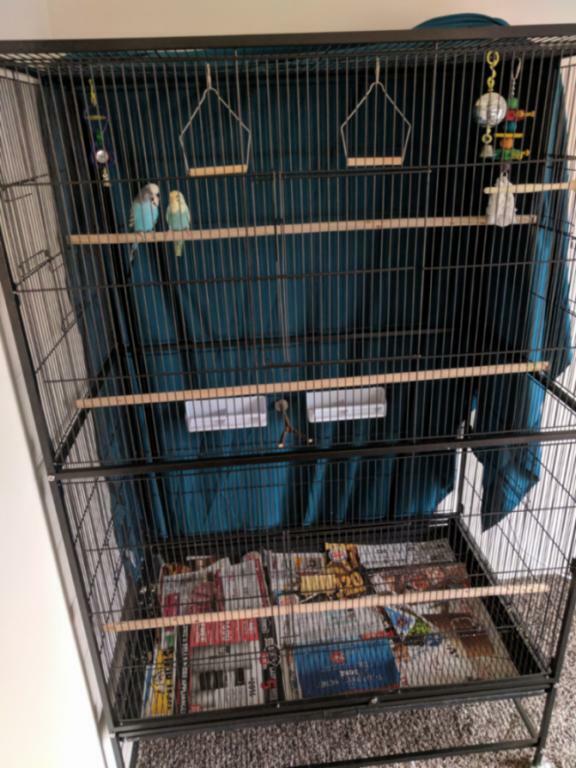 There are 2 large doors on the front of the cage, and then the 2 sides of the cage have 2 small doors each, the ones with the springs that only pull open from the outside and then snap back shut. There are 4 wheels at the bottom so the cage rolls around easily for cleaning, rearranging etc. 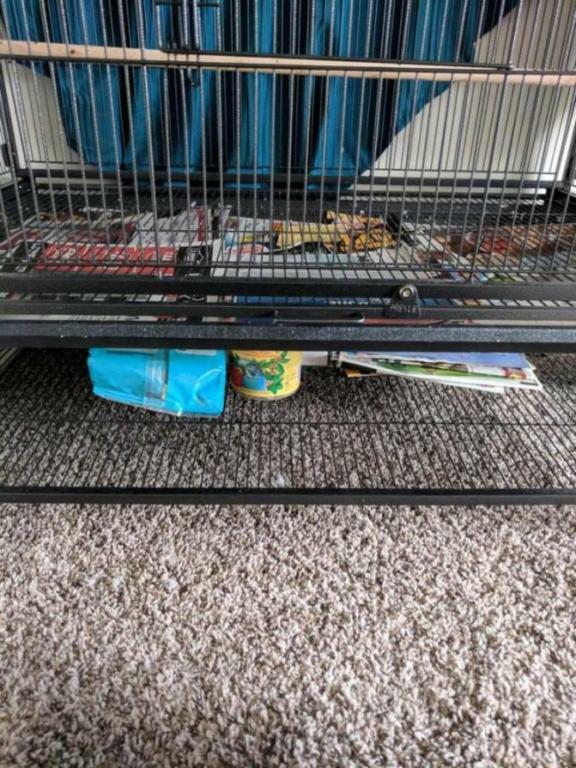 The cage came with 3 wooden perches and some white plastic food dishes. To be honest, the dishes aren't great. We will be replacing them when we have the extra money for it. We also need to buy more toys and perches, ladders, etc. now that they have all this empty space! So if you're looking to get a new cage, I think these ones are a good choice! 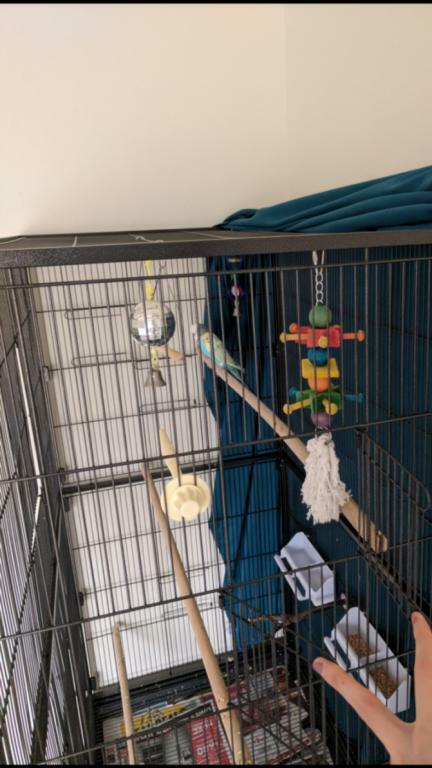 I've included some pictures showing the cage, and the birds enjoying it. &#x1f642; They love it, they actually sometimes don't want to come out and they want to go back in it when they do come out sometimes! Also wanted to add that the grate at the bottom of the cage, which sits just above the removable tray, has a little handle and pulls all the way out for easy cleaning. The grate at the bottom of Ozzy's old cage was not removable, so I thought that was a nice feature too! Thank you! Now we just have to fill it up with fun stuff for them! I'm glad you chose the F050. I have both the F040 and the F050 cages and prefer the F050 cages. The F050 cages are easier to assemble, are larger and sturdier as well. It is best to remove the wooden dowel perches and replace them with natural wood perches of varying sizes and diameters to help prevent pressure sores. I strongly recommend using clips or cable ties to secure the spring loaded side doors of both the F040 and F050 cages for safety. I've also found that using packing paper as my liner on top of the bottom grate works extremely well. If you change the paper twice daily, you can scatter the budgie(s) seed ration on the clean paper to allow them to forage for their seed. Each budgie should receive 1 1/2 - 2 teaspoons of seed per day. I divide my birds rations so they get 1/2 in the morning and 1/2 in the evening. The Prevue Hendryx Cage Cover for the Large Cage will work for both the F040 and F050 cages. Last edited by FaeryBee; 12-29-2018 at 08:26 PM. Wow! This is very helpful, thanks!